White House press secretary Sarah Sanders speaks at the governors’ fundraiser. 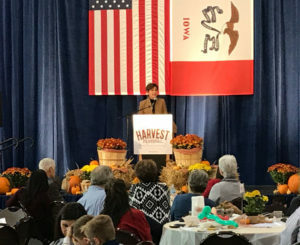 Republican Governor Kim Reynolds held her second annual “Harvest Festival” fundraiser this weekend, critiquing her opponent’s debate performance and bringing in reinforcements who stressed a national GOP campaign theme. 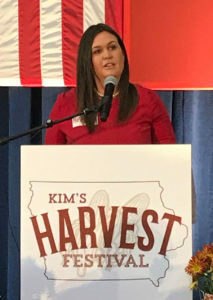 White House Press Secretary Sarah Sanders was the evening’s keynote speaker. She told the audience “elections have consequences” and there’s a 5-to-4 conservative majority on the U.S. Supreme Court now because Donald Trump is president. Senator Chuck Grassley said “Remember Kavanaugh!” should be the battle cry of every Republican campaign in the country. And Senator Joni Ernst asked the crowd to acknowledge Grassley’s role in getting U.S. Supreme Court Justice Brett Kavanaugh confirmed. 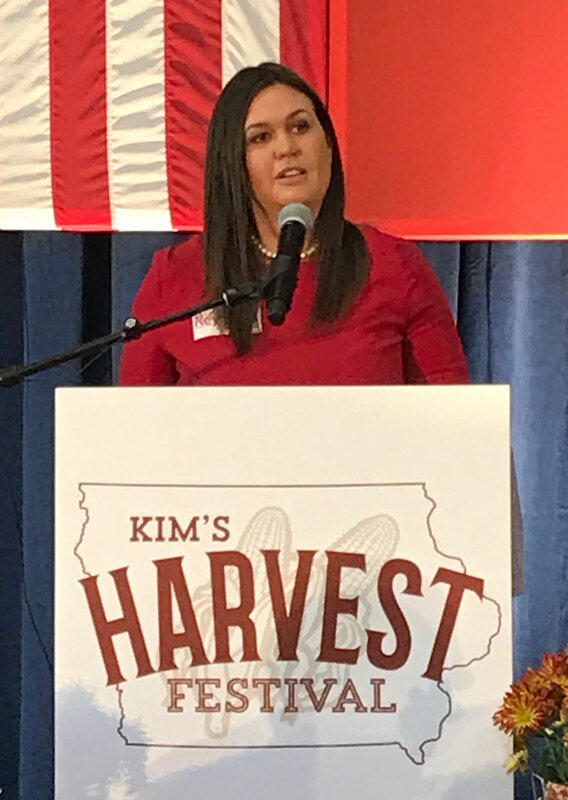 “I know this is Kim Reynolds’ night, but can we give a big round for Chuck Grassley?” Ernst asked. The White House press secretary also praised Grassley’s role as chairman of the Senate Judiciary Committee. That was the third of three ovations Grassley received from the crowd of Republicans gathered in Des Moines Saturday night. Reynolds, during her speech, asked the crowd if they’d watched her debate with Democratic challenger Fred Hubbell. “It’s no wonder that he didn’t look like he was having much fun,” Reynolds said. Reynolds and Hubbell are scheduled to debate again on Wednesday night. Their third and final debate will be held on Sunday morning.